1 of 3 Zest 1 orange, then juice; set aside 1 1/2 tsp zest and 1 tbsp juice. Whisk remaining orange juice and zest, oil, lime juice, rosemary, garlic cloves, salt, 1 tbsp ginger and 1/4 tsp pepper. 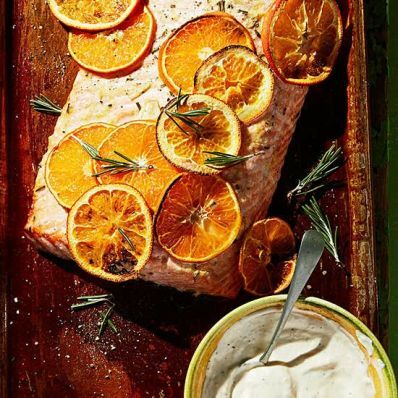 Place salmon in a baking dish skin side down; pour marinade on top. Cover and refrigerate at least 1 hour or up to 4 hours. 2 of 3 Meanwhile, whisk mayonnaise, mustard, minced garlic, 1 tsp ginger, reserved zest and juice and 1/4 tsp pepper. Refrigerate, covered, until ready to use. 3 of 3 Heat oven to 500 degrees . Cut remaining orange into 1/8-inch-thick slices. Remove and discard seeds. Transfer fish, skin side down, to a rimmed baking sheet or large roasting pan (discard marinade). Top with orange slices. Roast 15 minutes; reduce oven temperature to 425 degrees and continue roasting until fish is cooked through, 5 to 10 minutes. Serve with roasted orange slices and aioli.